"So the nonames slipped past Mr. Musta Drank the Purple Kool-Aid into third place and my nemesis PD - what? can't be - slipped to fourth." Next thing you know nonames will be requesting Nickelback play the halftime show at the HBFFL Humor Bowl 2012. That's right. 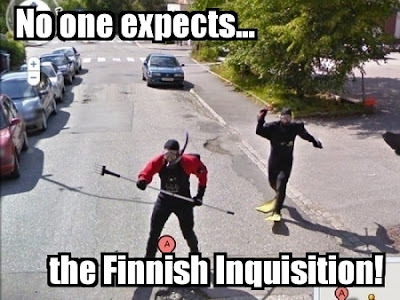 I am sending the Finnish Inquisition to taunt Unfinished Whatever into submission. Frankly, I have no idea why they are in scuba gear. Finnish people are weird. These people i scuba gear are'nt Finnish....the exact location is Bergen, Norway...you normally recognize a Finn very easely by their cheekbones, and their low sense of humor.